Why didn't Daenerys just do a fly-over in the first place? How did that guy run so fast in the cold to get back and send a raven? Where's Bran? Why is he not helping? Why is Littlefinger such a freaking sneak? Why is Arya going crazy? How far do you think Jon Snow and Daenerys are going to get before they realize they are Aunt and Nephew? Where did the Whitewalkers get those chains? Why didn't the fire dude make a fire for the group when they were literally chilling on the rock? Is Jon going to ride a dragon? This list makes me stressed. It just seems like everything is rushing and all happening at once. Probably because there are only 6 more episodes left until we have nothing to talk about anymore during Monday lunch breaks. I miss the painfully long storyline developments of Game of Thrones from years past. Did you see the preview for the next episode? It looks like it's going to be the WORST conference call/meeting in the history of meetings. 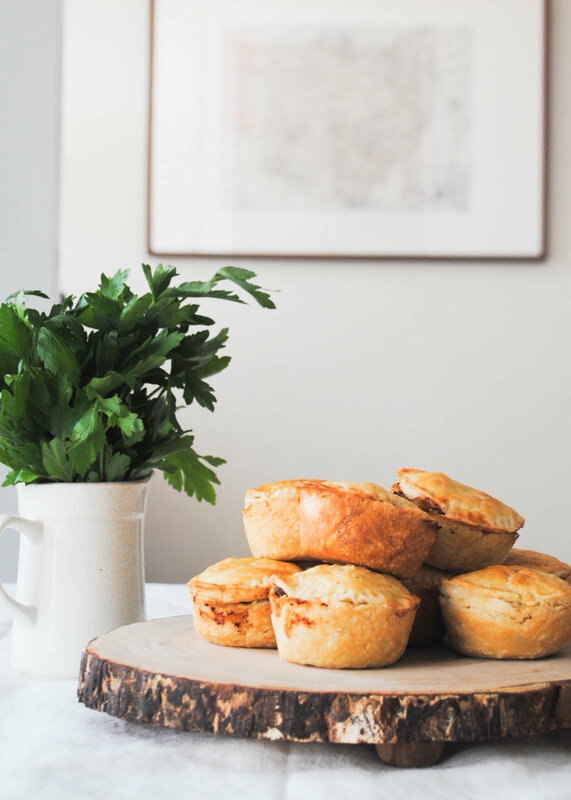 If you're going to a watch party this weekend, I think you need to make these meat pies. 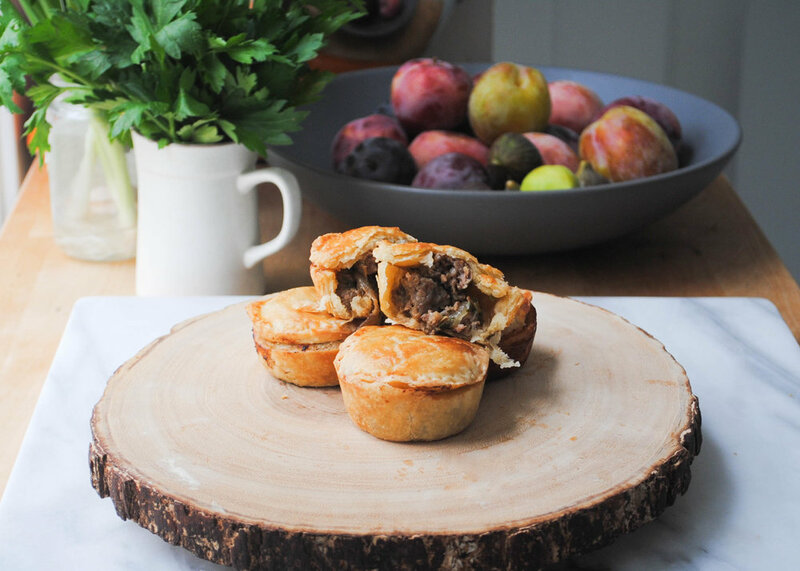 They are super cute, quicker to bake than a whole meat pie, and everyone is going to thing you are sooooooo clever! Isn't that the goal of themed parties anyways?? 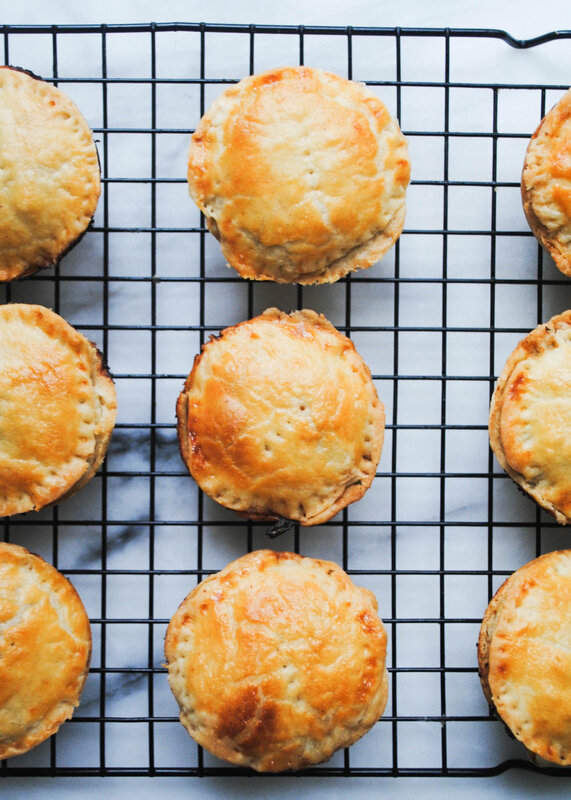 The pies are #freyfree and full of salty meat and cheese. It essentially tastes like a cheeseburger pie, which gave me the idea to make cheeseburger potstickers! So stay tuned for those. I think everyone in Westeros needs one of these pies to stress eat, plus Winter is here for like 10 years or however it works over there. I have some in the freezer waiting for me to defrost and stress eat too on Sunday! 1. Begin by caramelizing your onions because it's going to take awhile! Peel and chop your onion in 1/4" to 1/2" wedges. Heat 1 tbsp of olive oil in a skillet over medium-low heat. Once warm, add onions to the skillet and season with salt and pepper. Let them cook low and slow, stirring every few minutes until they have a deep golden color, about 30-40 minutes. Remove from pan and allow to cool. 2. While your onions are cooking, start your pie dough. Keep an eye on your onions though! Start by whisking together flour and salt. Add butter cubes and toss in flour until evenly coated. With your hand or with a pastry cutter, break down the butter into the flour until they are the size of peas or slightly larger. You still want to be able to see the chunks of butter. 3. 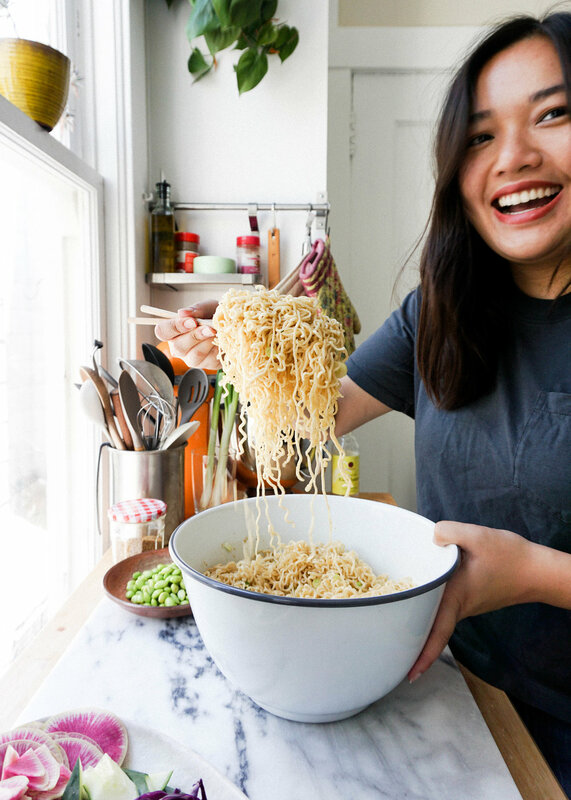 Make a well in the middle of your bowl. Add a few tablespoons of ice water at a time and mix just until the dough comes together. Divide dough in half and wrap in plastic and chill in the fridge for at least 30-45 minutes. 4. Heat 1 tsp of oil in the same skillet your onions were cooking in, over medium high heat. Add beef and italian sausage to the skillet. Use a spatula or the back of a wood spoon to help break the meat apart. Season with salt and pepper. Brown the meat for 4-5 minutes. The meat will continue cooking in the oven. Remove from skillet and add to a bowl to briefly cool. 5. Combine onions, meat, chopped parsley, and cheeses in a medium bowl. Set aside. 6. Preheat your oven to 400 degrees. Spray a cupcake tin with nonstick spray and set aside. Take out one ball of dough. Lightly flour your work surface and rolling pin. Roll out the dough until it is 1/8" thick. Use a 3" diameter (or one large enough to fill your cupcake tin) cookie cutter to cut out 12 discs. You will need to re-knead your dough scrapes and roll it out again to get all 12 discs. Line the tins with the one disc each. Gently pinch and stretch the dough to fill the edges of the tin. 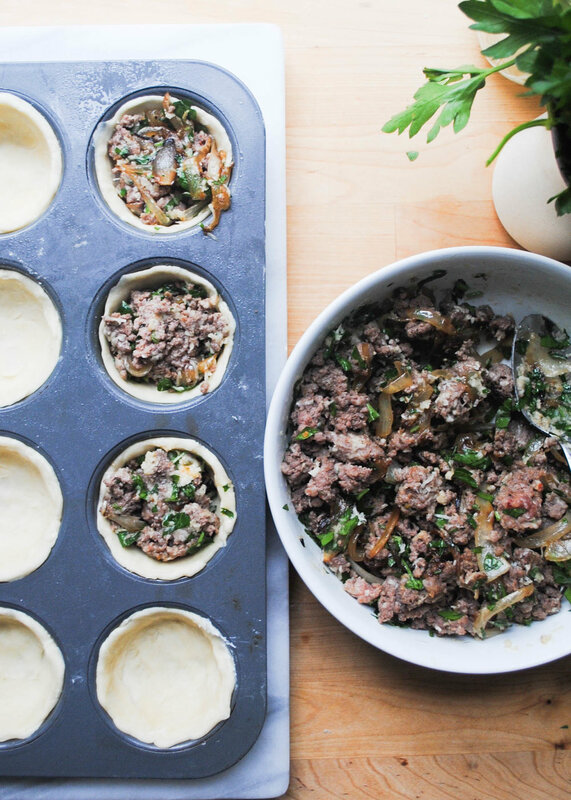 Fill each pie with your meat filling, you can pack them in a little. 7. 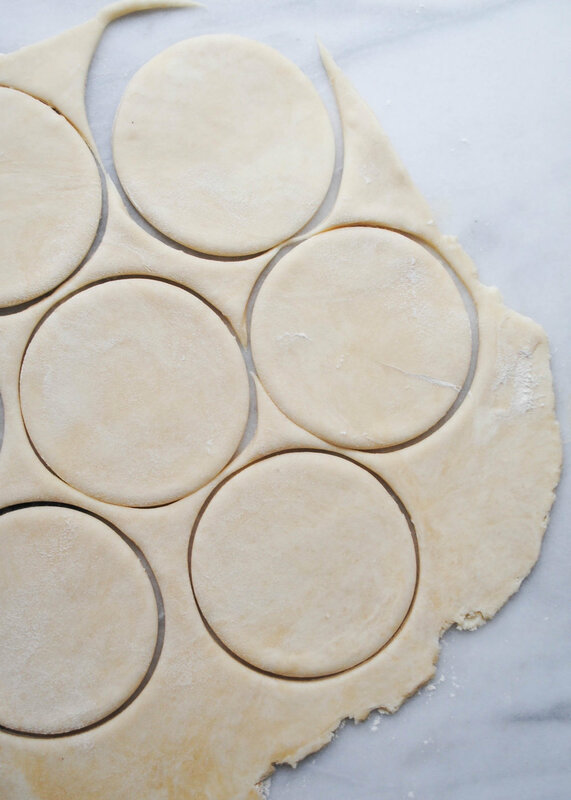 Roll out the second ball of dough until it is 1/8" thick and use a 2" to 2 1/2" diameter (or one large enough to cover the top of your mini pies) cookie cutter to cut out 12 discs. 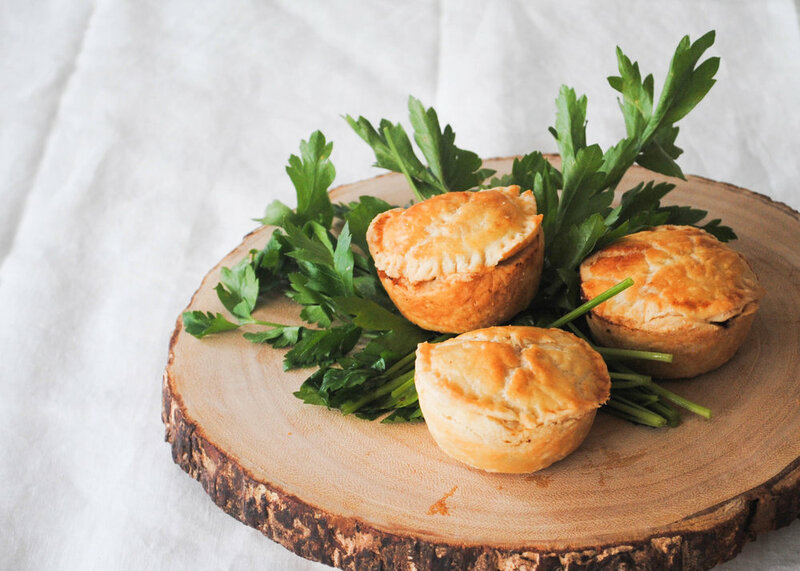 Top each pie with a disc of dough and pinch with edges closed with a fork. Poke a few holes in the top crust to allow steam to escape. Whisk together egg and water and brush the tops of the pies with the egg wash.
8. Bake the pies in the oven for 25-30 minutes until golden brown. Allow to cool and then serve!